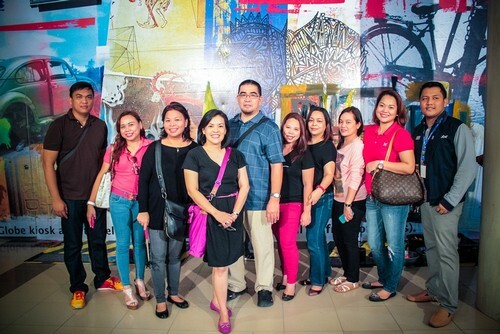 Globe Telecom is strengthening its business and operations in Cagayan de Oro with the opening of its world-class retail store dubbed as “Generation 3” Store in Limketkai Mall on December 2014. The Globe Store in Limketkai Mall in Cagayan de Oro is the second retail store of the leading telecommunications company to undergo major renovation, paving the way for one of the biggest milestones in telco retail around the world. The new Globe Store in SM North Edsa in Quezon City is also opening on December to offer Globe customers in Manila a new and leveled-up experience in availing of telecom services. The new Globe “Generation 3” Stores promise a fresh experience for its customers, boasting of a unique retail concept that is a first of its kind in the Philippines, designed by Tim Kobe, founder and CEO of Eight, Inc. whose brainchild is the iconic Apple store in New York. On the future Globe Stores, Kobe says, “Globe is transforming the customer experience in the Philippines and it will send shock waves far beyond.” Among his achievements, Kobe is responsible for the designs of the Apple Stores, the Nike Concept Stores, Coke, Knoll, Virgin Atlantic Airways, and Citibank. The “Generation 3” stores will house interactive lifestyle vignettes that will feature a myriad of products within interesting displays that make it more relevant to customers. The installations are made flexible and reconfigurable allowing the store to transform, keeping the environment always fresh and giving customers a reason to return. 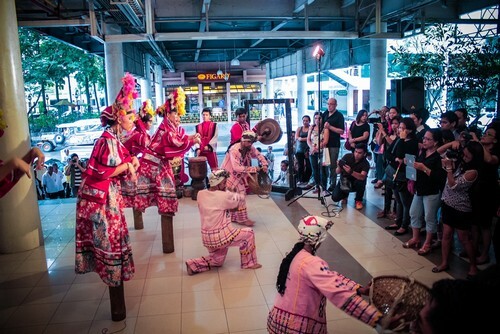 Prior to its big opening, the Generation 3 Stores will feature themed surprises – Arts, Community and Technology (ACT). 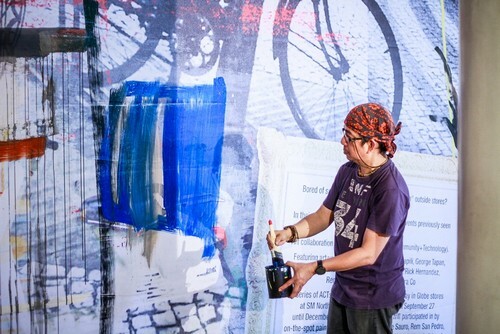 Working together with distinguished Filipino artists led by Ross Capili, Globe creatively boarded up its Stores with featured live art performances. 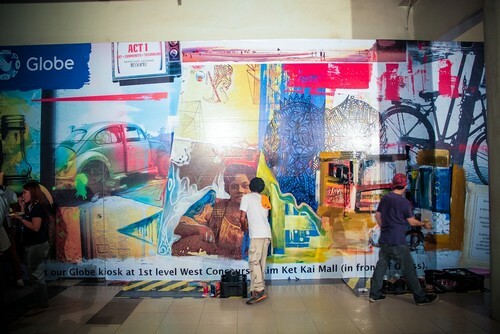 Capili working with the theme ‘past to future’ designed the mounted mural on the Globe stores. The mural is set to surprise onlookers every two weeks as participating artists keep on adding and drawing on the canvass. 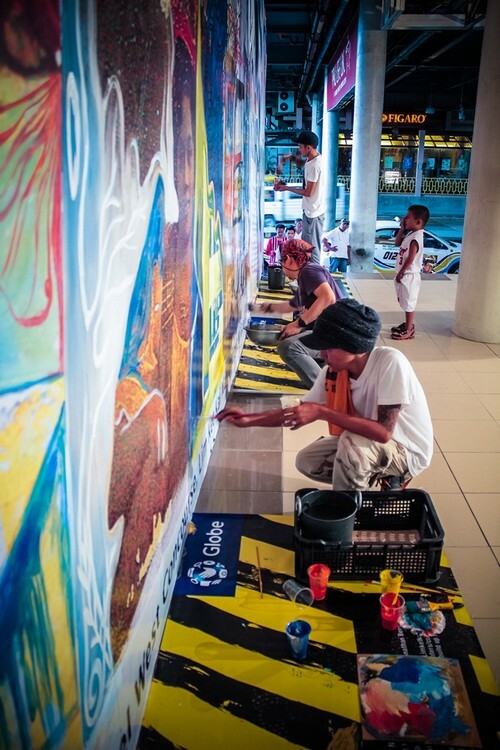 The live art had enthusiasts and followers abuzz in Twitter using the hashtag #Gen3nextACT and photos uploaded in Facebook as the artists wowed retail onlookers. 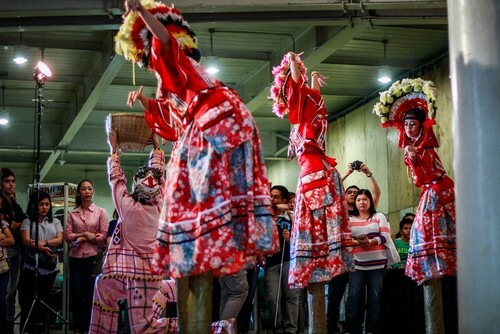 The art event at Limketkai Mall began in October 4 where Capili was joined by the first set of artists namely Joey and Archie Balcos. 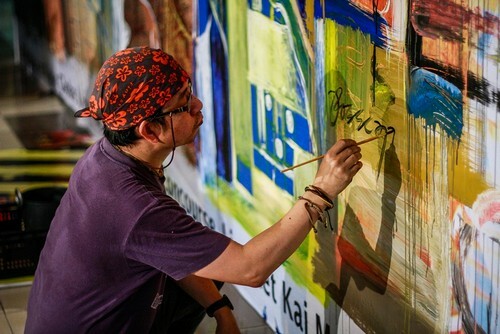 Capili has been in the art scene for almost 40 years specializing in varying expressions, movements and media. 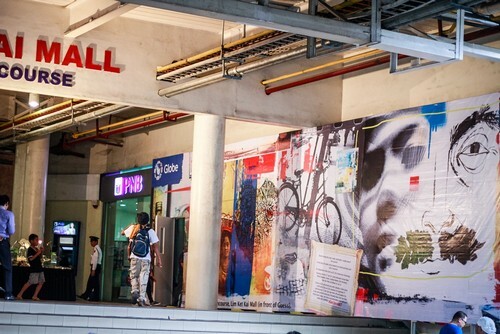 With successful exhibitions here and abroad, Capili is also the founder of the Facebook page ArtPhilippines, which gathers over with over 8,000 members composed of Filipino artists here and around the world.